En la vida real no sólo tenemos que lidiar con el amor y los demonios internos, sino buscar una vivienda que sea acogedora y esté bien localizada, todo eso sin hacer temblar nuestra cuenta bancaria./ In real life we have to deal not only with love and with internal demons, but also with looking for a cozy and well located home, but taking care of our bank account. Las ciudades contemporáneas plantean un panorama desolador que ninguna serie de Netflix ha contado, pero por lo pronto mi tercer apartamento millennial en Barcelona promete ser un lugar un poco más acogedor y mis tableros de Pinterest ya rebosan de ideas nuevas para decorar un pequeño espacio en el que me gustaría tener un sofá color verde (update: ya lo he conseguido), acentos dorados y muchas plantas capaz de generar no sólo aire puro, sino también contenido… hashtag green./ Modern cities pose a bleak picture that no Netflix series has told us, but for now my third millennial apartment in Barcelona promises to be a little more welcoming and my Pinterest boards are already filled with new ideas to decorate a small space: I would like to have a green sofa (update: I got one), golden accents and many plants capable of generating not only pure air, but also content … hashtag green. ¿Y tú, cuál de los siguiente elementos tienes en casa? 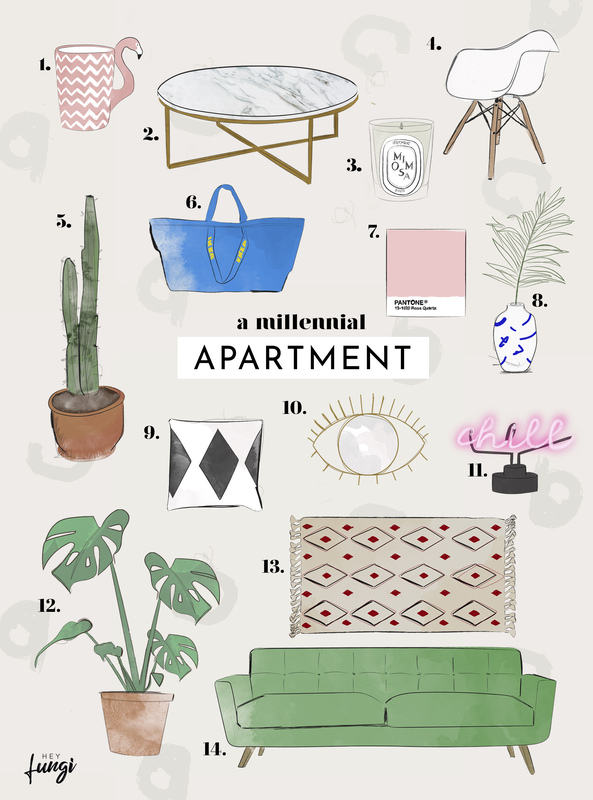 Yo aún estoy en la búsqueda de muchas cosas, pero amo el proceso de decorar mi pequeño apartamento millennial que debe funcionar como casa, estudio creativo y espacio para descansar./ Which of the following elements do you have at home? I am still in search of many things, but I love the process of decorating my small millennial apartment that should function as a house, creative studio and space to rest. I don’t have a flamingo mug (how cute!!! ), a marble table or green sofa but I do have a nice rug and some lovely plants. I’m pretty happy with my home, I don’t like the brutal mortgage credit we had to take in order to have it, but that’s life. They don’t tell you about that in films, do they? They always have the most amazing apartments in the movies, but getting a place in any metropolis is going to be pricey. Decorating can be pretty expensive too, but at least there we can save some money with being creative and DIY projects. Unfortunately, we can’t get creative with our rent or credit rates, lol. I absolutely love your illustrations. You illustrate furniture and plants so well. 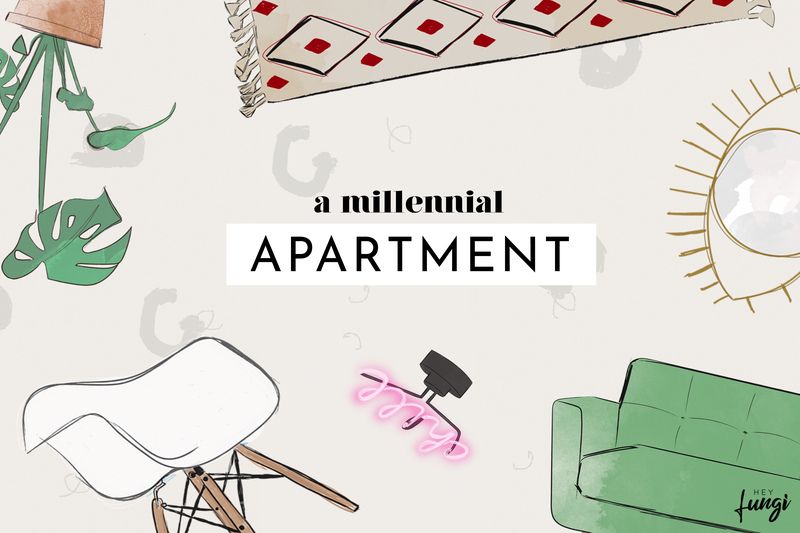 Your millennial apartment list looks pretty amazing. Thank you so much for all of your lovely comments. Congrats on moving to a new place Fungi. I would love to see the way you’ve decorated it and made it your own once it’s done. Moving takes so much time which is why I totally understand not being able to blog, but am so glad you’re back. Thank you for all your lovely comments. Happy week! I can only imagine that your apartment is decorated impeccably! You have amazing taste! So true «reality» is never portrayed on Netflix/TV. Even YouTube! But I would love to have any of these items lol! I tried to leave a much longer comment for days. But it kept timing out. Llevo 2 años viviendo con mi novio y no tenemos sala! Jajaja no nos terminamos de decidir por un sillón principal, luego cuando ya, vamos por el y ya no nos encanta jajaja. Lo que sí es que tenemos varias cosillas pequeñas que vamos coleccionando y con eso vamos decorando. Algún día tendremos una estancia para recibir visitas jajaja. I love seeing your article about interior! I bet they goes well with your millennial apartment! In Japan, there are not millennial apartment although millennial temples. I also think like you about Hollywood movies , but I really love only the apartment of Breakfast at Tiffany’s. Her bed is so small and the kitchen isn’t really big, so I can decorate like it! I’m looking forward to see your next post! This green sofa look so beautiful ! I would of love to have a green couch. And all theses objects and furnitures look so nice ! I also really want to decorate more my new house but I believe it takes time. Hey Pablo, welcome back!! !How are you? I’d looooove to have the chance to get a nice apartment, bright and well located to totally renovate and furnishing just following my ideas! And since my parents home is all old-style (you know, those houses with big paintings into giant baroque frames, bronze statuettes, parquet, carpets everywhere and curtain valances…) I’d totally love to live in minimal, pinterest-bright-pastellish rooms! Wishing you to get the perfect aprtment asap, my dear friend!